The standard Windows Start menu is far from ideal. Too often users find themselves taking too long to look for an application they want to start. 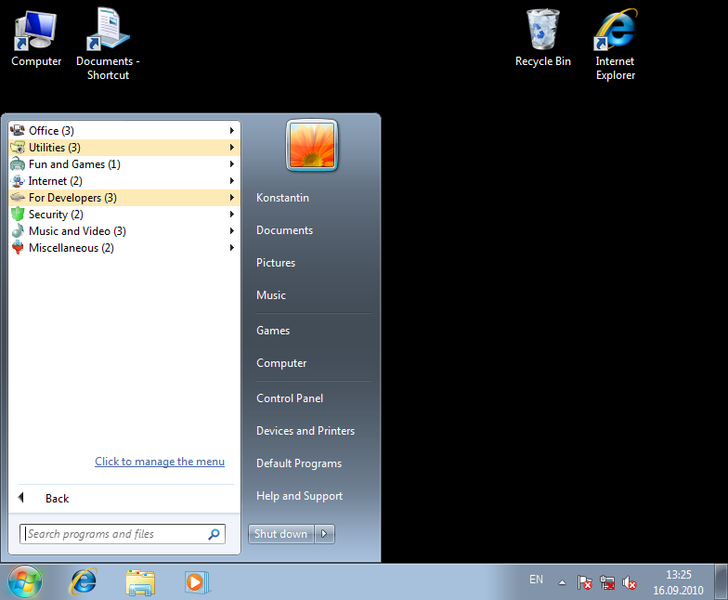 This happens because the Start menu often has a very long list of programs that are installed on the system. So, it takes quite some time to find the application you want to run. The Handy Start Menu program allows you to get rid of this problem by grouping Start menu applications into categories according to their purpose. Because applications are sorted automatically, the user is not required to do anything in most situations. There is also another inconvenience in using the standard Start menu. To run a program, you need to open a folder that contains that application. But why do we need to open a folder and select the main application shortcut every time we want to run a program? When you start using the Handy Start Menu, the menu folders become shortcuts. A single click on a program folder is enough to run a relevant application automatically. A folder does not lose its properties: It contains child items as before, and you can easily open any of them. It is important to note that the Handy Start Menu only applies a more convenient way of representing the content of the Start menu, rather than modifying files and folders physically. At any time, you can easily restore the standard look of the Start menu by disabling the Handy Start Menu program.